1) Get some air the night before. Make sure that you let the dress breathe by taking it out of the bag and allowing it to hang, supported by the hanger straps. Be sure the dress is in a room that is safe from the curious hands of children and pet paws. 2) Discuss with your hair and makeup artist the best way to get into your dress. Be sure to come up with a plan to figure out how to get into your dress once your hair and makeup is finished. Ask your hair and makeup artist for suggestions! 3) Put on your shoes after you put on your dress. Take a seat and allow someone to help you into your shoes after you are in your dress. Stepping into your dress with heels on runs the risk of snagging the material. 4) Determine how you will best use the ladies room. Yes, we know this is weird, but this is one of those things a lot of brides don’t think about and is important! Most dresses are going to either be fitted and difficult to maneuver in for this activity, or a dress with a full skirt can make bathroom access tricky. Discuss with a trusted friend, maid of honor, or perhaps a female relative how they might need to assist you. 5) Get familiar with your bustle. Most dresses will have a custom designed bustle. Review how to do your bustle with the one who will be pinning or tying it for you. It’s helpful to practice this at your final dress fitting. You can also have your seamstress take a quick video of the process! 6) Look out for your train. Be sure to bustle your dresses train as soon as possible after the ceremony, pictures, or first dance. This will help prevent damage to your dress. Does your dress have multiple parts? A ribbon for a corset, a slip or crinoline, or a jacket or overlay? Make sure all pieces are pressed or steamed, and in the garment bag with the dress. Be sure to include your veil and accessories, too! 8) Have a few safety pins on hand. You never know when a safety pin may come in handy! Accidents happen, regardless of how well your dress fits. Safety pins are a must have for your big day! 9) Take one thing at a time. Don’t rush getting dressed. Take your time! Enjoy every moment on your special day. Invite your photographer into your dressing room to capture special moments with the special people in your life. The skirt completely changes the look of the dress, right? Brides will often wear the overskirt for the ceremony and remove it for the reception–guests often think it’s a completely different dress. For brides who really love both the ballgown and fitted looks, a transformer dress is a great way to get to wear both on your big day. The ruffled skirt on this dress is actually an overskirt! Once it’s removed, it reveals this short lace gown, which you surely can dance the night away in on your big day. This gown comes with a removable wrap that can be used to add straps to this strapless a-line silhouette. It attaches with lace covered buttons on the sides of the dress, so brides can easily remove and reattach the wrap as they please. Amazing how these extra accessories truly transform a dress, don’t they? So, how can you turn your wedding gown into a transformer dress? It’s easy! Many designs nowadays come with the option to order a matching bolero or overskirt, you just need to ask your consultant about this option. If not, speak to your seamstress! 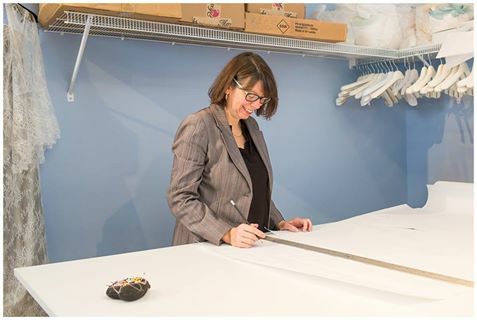 Here at Sealed With A Kiss we work with a lot of brides to create custom boleros and overskirts, and in this way we help brides create a truly custom look. If you’re local, just send an email to pat@sealedwithakissbridal.com to set up a time to meet with us and discuss your options! Sealed With A Kiss bride Kate married love of her life Jeremy at Keswick Vineyard last September. We’re happy to share a few photos from her special day! Kate chose an elegant a-line look from Justin Alexander for her big day. The illusion back on her gown is one of our favorites! Congratulations and best wishes to you Kate and Jeremy! Ask Pat: Do I need a separate dress for my wedding reception? Hi Pat! I recently went wedding gown shopping and have found that I really love the look of ball gowns, but I’m concerned about being able to dance in it, especially with the long train dragging behind me! If I do decide to get a ball gown, should I get a different dress for the reception? I just want to be sure I’ll be able to bust a move on my wedding day. Just because you’re getting a ball gown dress doesn’t mean you necessarily need a second dress in order to comfortably dance the night away. Often once the dress is in your size and altered to fit properly, you’ll find that moving around in it is much easier than when you tried on the store sample. Having a bustle built into the dress to get the train out of the way will also help so much–it will keep you (and your guests) from stepping on it. All that being said, if you’re planning a big first dance number or you know you’ll want to be completely unencumbered by the many layers most ball gowns have, then getting a second reception dress is definitely a good idea! Your dress shouldn’t get in the way of you having a great time at your wedding. For as long as I remember, I’ve had an inclination to be a designer. As a child I sewed and used things from bags of clothes and hand-me-downs to create my own looks. I’d change them up from the age of 9 or 10 when I had started sewing my own clothes. I’ve always experienced clothing this way. My mother designed and sewed my dresses as a child – she used patterns but always changed them up to make her own creations. She allowed me to assist in the choosing of the fabrics, colors, etc. This started from a very young age of about 5. I started sewing myself a couple years after that, and won child competitions with my work. I never went with the status quo. I was interested in making things outside of the usual. I loved experimenting with fashion and trying new things. I’ve been designing gowns ever since I started fashion design in college. I had a long time dream of designing my sisters’ wedding dresses, and it was in 1993 when my sisters started marrying that I had the opportunity to design and create their wedding day looks. Things just started growing from there. I enjoy wedding gown design because design is never static. Part of my design style adjusts with the trends and seeing what my brides like. My design style is more “classic with a twist.” I’ve never followed trends exactly, I prefer to be a little ahead of what’s currently happening. However, I do think hard about what my customers would like, whether that’s in the way of trends, figure flattering shapes, or wearability of the dresses. I often take a retrospective look, and although my personal aesthetic is minimalist, classic and traditional, there are always twists to the look. The “twist” is the opportunity to incorporate the new trends and ideas. That’s what keeps design exciting. Entrepreneurship wasn’t really what I had originally envisioned myself doing, but I think it was inevitable as both my parents were business-owners. It just came naturally to me. I think it goes along with the whole “out of the usual” aspect of the way I enjoy doing things. I am an innovator and love trying things a new way, so naturally entrepreneurship became something I gravitated towards without intending to. I was searching for a career and believe you should do what you love, and what you are good at. I wanted to find a career I would never get tired of, and I never have. I just wish there were a hundred hours in a day so I could do more! I went to college to equip myself with the tools I needed to carry out my chosen profession. The passion, desire, and creativity was already there. My end goal was to set up a design business as soon as I graduated and, basically, that’s what I did. I have never looked back. I have been supporting myself solely through my endeavors ever since! Wedding Gown Style: Gowns with Pockets! More and more designers are adding a little something extra to their designs–namely, pockets! Goodness knows on the wedding day there will be several small items such as bobby pins, tissues and lipstick that you’ll want to keep handy, and these dresses give you a convenient place to store them. Take a look through some of our favorite designs with pockets! 1. This first pick has pockets built right into the silk Dupioni skirt. The bodice is fully beaded, and there are silk and rhinestone buttons to the end of the train. 2. We love this Thai silk ball gown! It has a v-neck bodice accented with scalloped lace, and a lace illusion back with buttons. 3. This two-piece wedding gown is absolutely fabulous! The bodice features a drop waist, sweetheart neckline and beautiful lace appliques, while the mikado skirt is complemented with buttons and a cathedral lace train. 4. Brides adore the lacy off the shoulder neckline on this gown! The gathered waistband accentuates the waist, which flows into a very full gathered silk skirt. 5. For the bride interested in a glamorous look, this gown is bound to be perfect! Beaded appliques over metallic lace adorn the bodice of this V-neck ball gown to the basque waistline. This royal look is completed with an illusion V-back, Silk Dupioni skirt, pockets, and a cathedral length train. A few months ago the wonderful Terri of Terri Isenhour Photo approached us about a shoot she was planning with Logan of Real Southern Accents at Green Springs Plantation. They were looking for a gown with some Southern flair that would complement the acres of greenery and old world charm at the plantation. 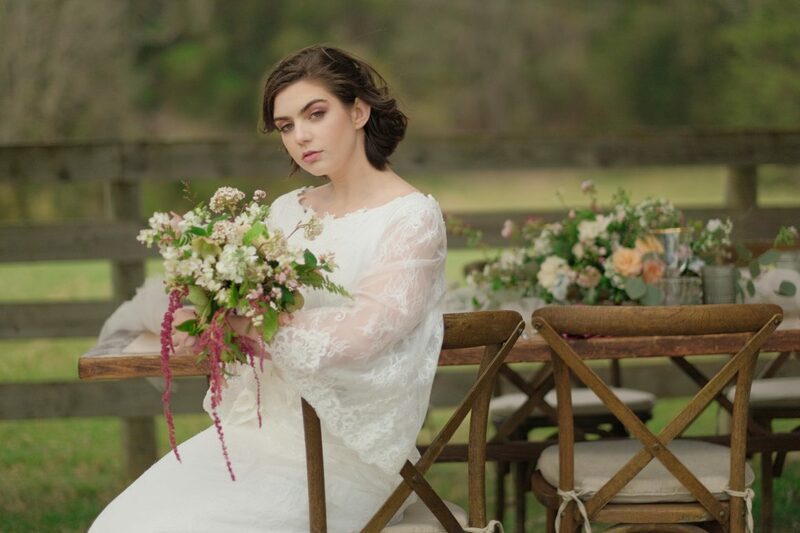 One gown from Augusta Jones immediately popped into our heads, and turns out it was just perfect for the venue. Ask Pat: What should I do if my daughter and I have different opinions about her wedding gown? Dear Pat: I will be helping my daughter shop for her wedding gown in a couple of weeks, but am worried about upsetting her with my opinions on dress styles. I love my daughter, but know from past experiences shopping with her that we do not see eye-to-eye on most things. She has already sent me pictures of styles she’s interested in, and they are nothing close to what I had in mind for her. I want her to love her dress and be happy, but I am afraid that I might ruin her shopping experience if I speak my mind. How would you advise I handle this? Chances are if you’re worried about differing opinions on the wedding dress, your daughter is as well. She likely knows that you disagree with the styles she’s interested in, but she wants you to be there by her side when she says yes to the dress because she loves you, and she respects your opinion. The key to you both having a great shopping experience will be to keep in mind exactly what you just told me–you want her to love her dress and be happy. When she asks what you think about a dress be honest with her about certain elements of the dress you like and dislike, but remind her that you want her to have what she wants regardless of your opinion. If you sense she’s fallen in love with a dress, be supportive. Just remember that she’s your daughter, and you’ll be glad you had the chance to share the shopping experience with her. Brides, get excited! More amazing styles will soon be available here at Sealed With A Kiss. Stay tuned for more details, but for now here’s a peek at a few of the dresses you’ll see in store very soon! With head to toe lace appliques and embroidery, this gown is fit for a queen. It features an a-line silhouette and a regal lace and satin train. This is a design we are extremely excited to see in store! It’s a chic, unique look that we’re sure our brides will love. What caught our eye about this dress was the gorgeous lace pattern and the lovely silhouette. We can’t wait to slip this gown onto a bride and watch her fall in love!